Midway is an incredibly energizing place. Full of life! 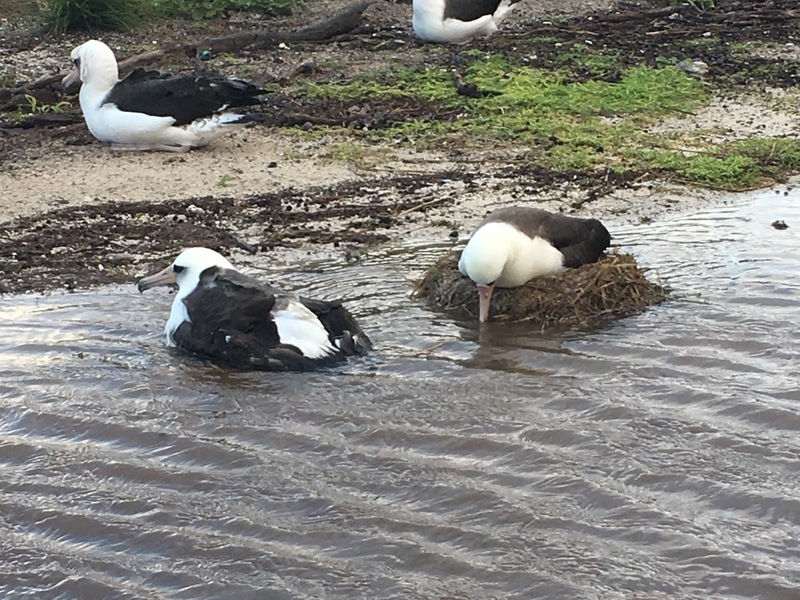 Much has been and is being done by the US Fish and Wildlife Service to return this piece of real estate to its native birds, turtles and monk seals, through habitat restoration and removal of debris and decaying buildings. It’s humbling to be one of just a few dozen humans sharing this tiny space with hundreds of thousands of birds, that blanket the sky on windy days, buzz you on take-offs and landings, and seemingly never stop whistling, honking, and twittering. On the other hand, there are also constant reminders of nature’s unforgiving force. Over the past couple of days a raging storm front has been passing through. 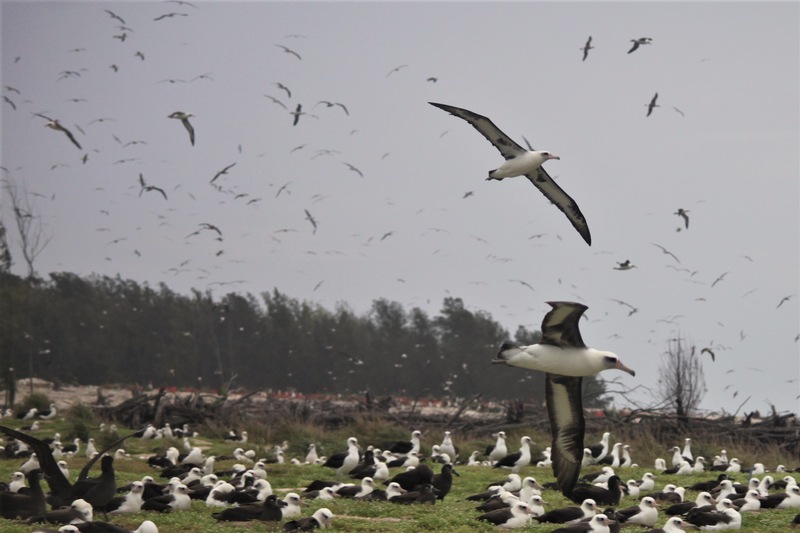 On Friday the downpour brought flooding that devastated many albatross nests. Some parents were seen nudging and ‘meeping’ at eggs that had floated away from their nest; others huddled stoically on totally submerged nests with little hope of their offspring’s survival. Non-nesters are also victims of the weather. On Saturday, despite a sunny break from the rain, the winds were so vicious that there were many hard landings, though the ones I witnessed seemed to escape any damage…except to their pride! 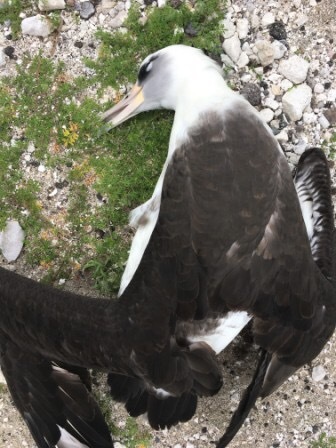 Worse, several birds were blown off course and slammed fatally into obstacles such as concrete remnants of buildings. At least (for those we were aware of) death was instantaneous. I came across this gorgeous adult lying beside a concrete wall. Its soft, perfect body was still warm. I held it and cried! This is the harsh reality, survival of the fittest. 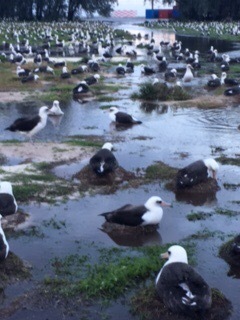 Staff and volunteers who are here during summer months have to bear the sad sight of thousands of starving albatross chicks that do not survive…many of them victims of ‘death by plastic’; but they also have the thrill of watching a far larger number fledge successfully, and knowing that their hard work has helped them on their way. This entry was posted in Uncategorized by kauaigreenhorn. Bookmark the permalink. Wonderful observations of the cycle of life and death on Midway. Thanks Louise!